Learning a new language on your own always sounds like a fun little adventure until you actually get going. The grind sets in pretty early, especially at the beginner level, as you strive to memorize enough words and rules through repetition to be able to string a few semi-coherent sentences together. Thankfully, we have smartphones now and the whole process has been made just a bit easier with the decent selection of language learning apps out there. I’ve used a few in the past and, although they were helpful in memorizing some extra vocabulary they were often lacking in some aspect. Flashsticks set out to go the extra mile with their FlashAcademy app. 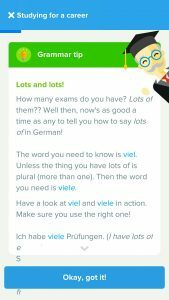 I had the opportunity to spend some time with their excellent German language course (beginner, advanced, and intermediate) and I came away with mostly positive impressions of the app. 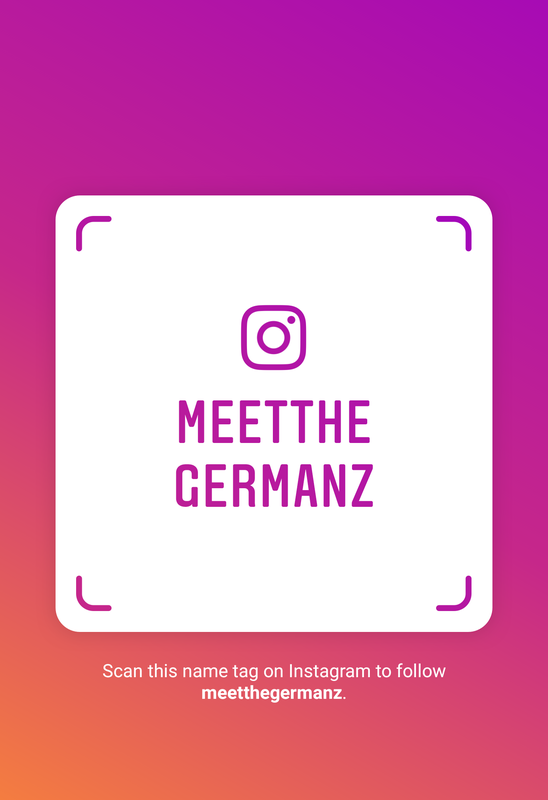 I speak German at an intermediate level. 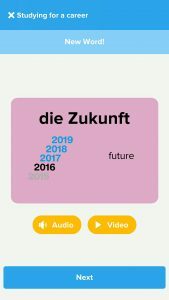 We also have a 10% discount on your purchase on www.flashsticks.com if you’d prefer learning with physical flashcards using the coupon code THEGERMANZ20. It’s the same company. Apps like these are generally designed to be used on the go and this is no exception. The short lessons take about 5-10 minutes to complete and are based around themed vocabulary. The beginner lessons cover things like everyday objects, family, clothes, and food, while the advanced lessons tackle more complex subjects like business, politics, global issues, and more. FlashAcademy uses flashcards along with audio and video to teach you new words. While audio is essential if you want to figure out the correct pronunciation of words, the video portion goes the extra mile and is a really nice touch. I speak a few languages with varying degrees of competency, but one thing I avoid like the plague is getting stuck into a phone conversation in one I’m not that comfortable with. Being able to see the person you’re talking to makes everything so much easier. Every flashcard in the app is accompanied by a short video of a native speaker pronouncing the word slowly and I think that little feature will be an immense help to a lot of people. The activities in each lesson are nothing groundbreaking, but there is a nice enough little mix to keep you on your toes. These include choosing the correct English meaning for the word, choosing the correct picture to match the word, choosing which word was said by the native speaker, or tapping letter blocks in the correct order to spell it out. These activities all include audio of the native speaker drilling the words into your head and I found them to be quite effective. Each unit also challenges you to get out of your comfort zone a little bit by having you put words in order to make sentences, which it then reads out to you. It’s a great way to add some context and help you start using the vocabulary. It also increases the difficulty at higher levels by including words that don’t belong in the sentence at all. Another nice idea is the short dialogue activity at the end of each lesson. 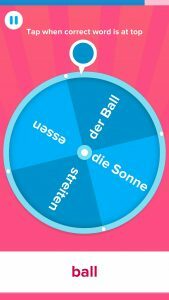 It asks you a true or false question and you have to hunt through the dialogue in order to answer it. I spent over 5 years as an English teacher in South Korea and I can’t even count the number of times I saw the panic set in on students’ faces when they were doing a listening or reading activity and found that they couldn’t understand every single word. This almost always caused them to miss out on the stuff they did recognize. I think learning to skip over those things and focusing on getting the gist of what is being said is a very important skill and this activity is very good practice. The dialogues contain a good deal of language that has not been taught yet, but they offer enough information to be able to answer the question. A translation of the whole thing is provided afterwards for further study. 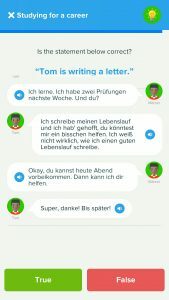 These short conversations are also great for getting a feel for conversational German and are an effective supplement to the vocabulary-based lessons. That being said, I do have a couple of minor complaints about the dialogue portion. The main problem is that even though there is a little speaker symbol next to each line of dialogue, there doesn’t seem to actually be any accompanying audio. I tried this with multiple lessons across all of the levels and I could never get it to play. I also had a bit of a laugh when “Eva” was actually a balding bearded guy in one of the lessons. I can see that causing a bit of confusion. Another welcome feature is the inclusion of culture and grammar tips in the vocabulary lessons. They would pop periodically in between words to offer an interesting cultural fact about Germany or to further explain an aspect of grammar or pronunciation. 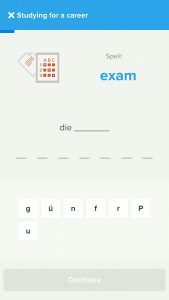 Explanations of how sentences and basic grammar work have been conspicuously absent from vocabulary-based language apps I’ve tried in the past, so I was quite excited about these. Learning some rules as you go along is really helpful when you want to start using the words you learned to make correct sentences. The tips also point out “false friends”, or words that look recognizable but mean something different (e.g. der Rock: skirt, not an actual rock), which can potentially prevent some misunderstandings. You can test your knowledge at the end of every series of lessons with a rapid-fire selection of fast-paced games incorporating all of the words you’ve learned. They are both fun and challenging and test your reflexes as much as they test your vocabulary. Even with a decent amount of German under my belt, the beginner level games managed to mess me up a few times. I’m not even really a fan of twitchy cell-phone games but I thought this was a good way to end each unit and the games turn repetition and practice into a delight rather than a slog. You can also add any friends who are using the app so you can compare high scores. FlashAcademy proudly boasts the world’s first-ever object translator. The first iteration of almost any technology is going to come with its share of glitches and limitations, and this is no different. 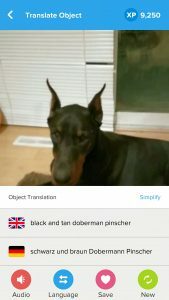 It works by scanning anything you take a picture of, and then translating it into your chosen language. I took it for a spin around the house, taking pictures of various objects with mixed results that alternated between impressive and hilarious. While the dog was correctly identified right down to the color and breed, it thought my door was a pair of jeans for some reason. It did correctly identify my e-cigarette though (and that it’s made of stainless steel), and it recognized actual blue jeans as well, so results may vary. I think the object scanner is more of a novelty for the time being, but it could be quite promising with future updates and improvements. The scanner is supposed to work with the flashcard post-it notes you get for free if you buy a one-year subscription though. Scanning one of the post-it notes is supposed to play a video of a native speaker teaching you how to pronounce the word, but I was not able to test out this feature. There’s not much to say here. The design is quite simple with menus that are easy to navigate and a bright color scheme. I found everything to be very intuitive and responsive. One thing to point out is that the developers did a good job with the flashcard pictures. I didn’t find many instances where there were similar words in a unit and the pictures were overly ambiguous. This tends to become a problem as the vocabulary becomes more complex, but the advanced lessons I went through handled it well. FlashAcademy is probably the most ambitious language app I’ve had the opportunity to try. It manages to pull enough of it off to make it worthwhile for any aspiring language learner. There are some rough edges, like the object scanning feature and the lack of dialogue audio, but the actual lessons are really well done. 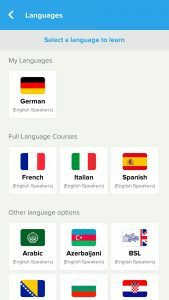 The app currently offers full courses in Spanish, German, French, and Italian. An impressive selection of other languages (from Arabic to Zulu!) is available just in the object scanner at the moment with more courses planned for the future. While I wouldn’t get it just for the object scanner, the full courses are well-done and definitely worth a look. You can download it for free for your Android or Apple phone. This gets you 6 lessons, 5 translations using the scanner, and 2 sections worth of games. In order to keep using it you have to get a subscription which can be one, three, six, or twelve months. A full year will set you back just over $40 and comes with a free set of flashcards. Considering the price of language books and courses, it’s not a bad deal. Also, don’t forget about the 10% discount on your purchase on www.flashsticks.com if you feel like physical flashcards are more beneficial to you. 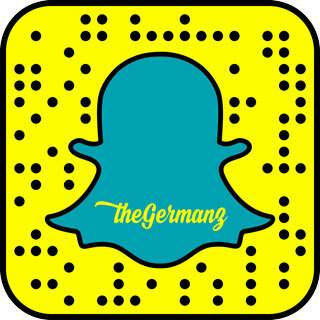 Simply use the coupon code THEGERMANZ20 when checking out.